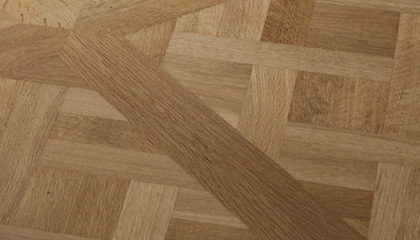 Beautifully constructed panels hand made in Antique French Oak retaining its original surface. We consider these panels to be a correct representation of the panels in the Palace De Versailles. The original surface oak has been carefully restored using traditional techniques. Repairs have been instituted where necessary as can be found in the original floor. In our opinion this architecturally correct Versailles panel in antique French Oak is the closest most authentic representation available. We also offer a range of other versions such as completely re-machined reclaimed French Oak, or an option constructed from our Mississippi Oak. Also available in our Victorian pine. Please ring for details and lead times as these exclusive panels are bespoke made to order. A correct hand made and finished Antique surfaced French Oak Versailles panels. The best! 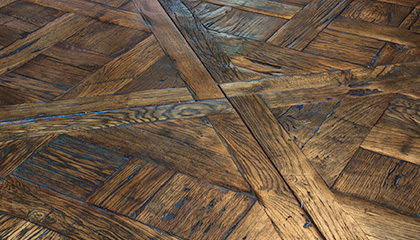 The Antique Oak Flooring company produces a range of Versailles patterned panels in new, re-machined, and original faced Antique oak. We consider these to be constructed in an architecturally correct dimension and proportion. The pattern and size are traditional and can be laid on the square with matching strip borders or on the diagonal as in the Palace de Versailles. The original surfaces on each of the component parts, is individually restored prior to being formed into the panel. This ensures that the unique character in the antique surface is retained. These panels are constructed to order and will be subject to a lead time, which is dependent on our workshop schedules.